Eating slowly is one way to avoid overeating while dining out, a study found. If your love of eating out is hampering your diet resolution, you're not alone. But every time we choose to eat a snack or meal away from home, we add an average of 134 calories a day to our diets. Over the course of the year, these extra calories translate to a weight gain of about 2 pounds, according to an analysis from the U.S. Department of Agriculture's Economic Research Service. But there's hope, according to a study published in the Journal of Nutrition Education and Behavior. 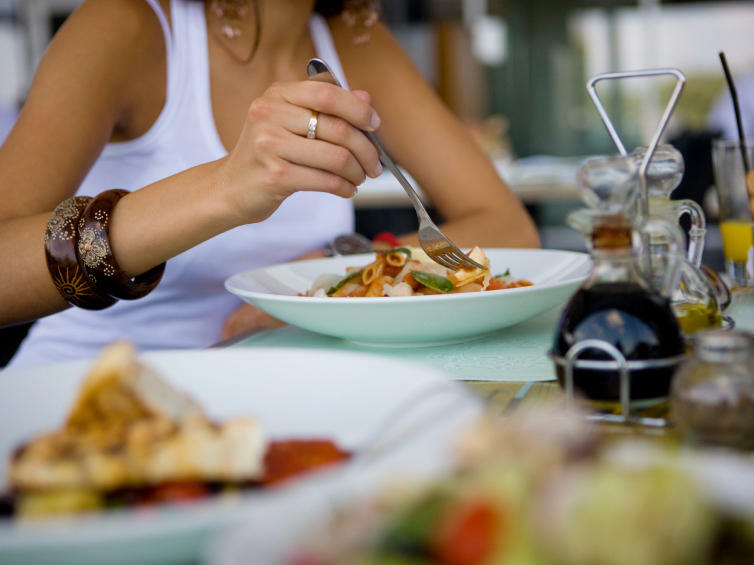 Researchers at the University of Texas, Austin found that women who enrolled in a six-week mindful eating program could learn to eat significantly less while dining out. Gayle Timmerman, the study author, found that women were eating 297 fewer calories per day after completing the program. And they lost, on average, about 2.2 pounds. "Slowing down was really key. You're paying attention to the texture [of each bite] and taste and smell," says Timmerman. "You're really kind of savoring it." Some women succeeded by eating less at home, and strategically saving the calories for dinner when they'd be dining out. Other women learned to eat less at each meal, whether home or in a restaurant. "Do this exercise with a friend. You will need one small slice of an apple for each person. One person reads the instructions listed below while the other person completes the exercise. Take one bite of an apple slice and then close your eyes. Do not begin chewing yet. Try not to pay attention to the ideas running through your mind, just focus on the apple. going on in your mouth. chewing. Notice each tiny movement of your jaw. stay present and notice the subtle transition from chewing to swallowing. any sensation of the food remaining. Take a deep breath and exhale."